Before the end of 2018, NCR people will get three new metro route. DMRC is preparing to open these sections in December. This will improve the connectivity of the metro between Delhi-NCR. After the opening of these sections, only 10 km of Delhi Metro Phase-3 will be left which will be opened after January. New Delhi, Metro Rail News: Before the end of this year, the National Capital Region (NCR) people will get three new metro route. The Delhi Metro Rail Corporation (DMRC) is preparing to open three more new sub-sections in December 2018. Out of these two sections are in NCR which will improve the connectivity of the metro between Delhi-NCR. After the opening of these sections, only 10 km of Delhi Metro Phase-3 will be left which will be the opened after January. After the opening of new corridors of 50 km Delhi metro will finally mark the completion of Delhi Metro’s Phase III project. The three new corridors set to be opened are the 9.7-km stretch connecting Lajpat Nagar to Mayur Vihar Pocket 1 on the Pink Line, the 9.4-km stretch from Dilshad Garden to New Bus Adda extension of the Red Line and the 29.7-km long Aqua Line of Noida Metro Rail Corporation (NMRC). 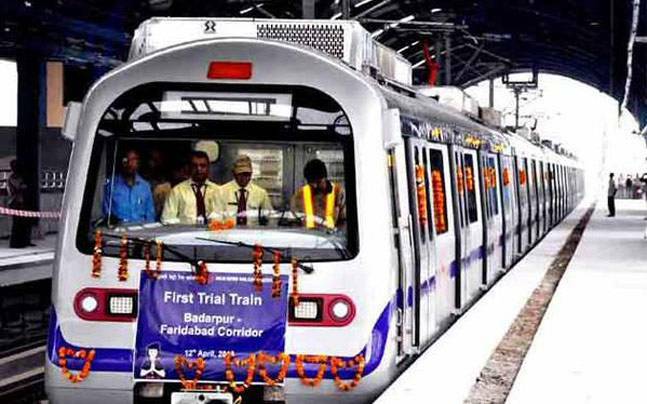 Delhi Metro Rail Corporation (DMRC) started trial runs on Lajpat Nagar and Mayur Vihar Pocket-I, Dilshad Garden to Ghaziabad Bus Adda and Escorts Mujesar to Ballabgarh. these section of Delhi Metro will be expected to be operational by the end of this year. This 9.7 km-stretch, an extension of the currently operational Majlis Park Lajpat Nagar section, will be a major boon for commuters of prominent areas such as Ashram, Vinoba Puri, Mayur Vihar, etc. The stretch will also put Hazrat Nizamuddin railway station on the metro map for the first time. Hazrat Nizamuddin metro station will also be connected with the ISBT at Sarai Kale Khan. The Lajpat Nagar-Mayur Vihar Pocket-I stretch will also see Delhi Metro cross the Yamuna for the fourth time. The other three corridors that bridge the Yamuna are the Red, Blue and Magenta Lines. This 9.41 km stretch, an extension that will connect the Rithala-Dilshad Garden (Line 1) to Ghaziabad’s New Bus Stand via a fully elevated corridor. The second section is on the extension of the Redline of Delhi Metro, under which the Red Line will be extended from Dilshad Garden to Ghaziabad’s New Bus Stand. The project cost is pegged at ₹2,210 crore as per the revised detailed project report; the Metro is most likely to initiate services by the end of 2018. The corridor has eight stations at Shaheed Nagar, Raj Bagh, Rajendra Nagar, Shyam Park, Mohan Nagar, Arthala, river Hindon and New Bus Stand. The Red Line presently operates on a 25.09km route and the new extension in Ghaziabad will increase the entire route to a length of 34.5km. The 3.2 km-long Escorts Mujesar-Ballabgarh section of Delhi Metro’s Violet Line is now ready for passenger operations, the DMRC said Today. The section will be flagged off by Prime Minister Narendra Modi on Monday through remote control. Ballabhgarh will become the fourth city in Haryana to get metro connectivity after Gurgaon, Faridabad and Bahadurgarh. After the opening of this extension, the entire Kashmere Gate – Raja Nahar Singh Metro corridor will become 46.6 km-long. “Currently, 25.8 km of metro lines are operational across Haryana. After the opening of this section, the total length of metro kilometers in Haryana will become 29 km. All trains running on this section are manufactured in India,” the Delhi Metro Rail Corporation (DMRC) said in a statement. “The Escorts Mujesar–Raja Nahar Sigh (Ballabhgarh) section will be extremely crucial from the point of view of connectivity for the city of Ballabhgarh, Faridabad, South-East Delhi, and Central Delhi areas. “Ballabhgarh is an upcoming urban settlement which is an industrial city. Large numbers of people travel every day for their professional requirements from Ballabhgarh to Delhi and vice-versa,” the DMRC added. The Raja Nahar Singh Metro station of this section will be integrated with the Ballabhgarh Railway station and the interstate bus terminal of Ballabhgarh directly with a foot over-bridge, which is currently under construction. “A peak hour frequency of six minutes and 48 seconds will be maintained on this section between Badarpur and Raja Nahar Singh on weekdays,” the DMRC said. All trains, which till now were operating till Escorts Mujesar, will go up to Raja Nahar Singh. A total of 40 trains will be operational on the entire Kashmere Gate – Raja Nahar Singh corridor, it said. Previous articleDelhi Metro Rank Seventh Busiest Metro Rail Network In The world.